Want to become something that is both powerful and elegant this Halloween? Well, then we’ve got just the thing for you! 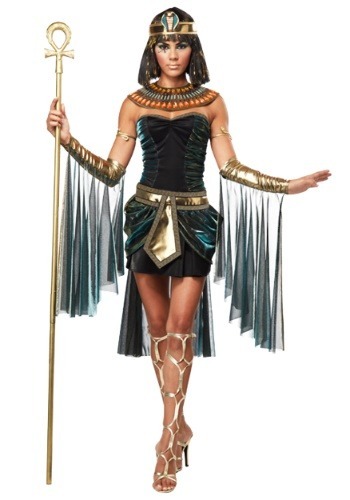 Check out this Plus Size Egyptian Costume Goddess Costume. You will truly rule the night in this amazing outfit! There are many different gods in Egyptian mythology and they all hold different responsibilities. Will you be a goddess of the sun or of the moon? Will you offer fertility and prosperity or death and destruction? Will you have control over earth, fire, water, or wind? Those are all questions that you will have to answer once you toss on this divine outfit. The dress alone is a thing of beauty, but when combined with the golden belt, the flashy sleevelets with their attached drapes, and the colorful collar, you will truly look godly! Once you top of the whole costume with the cobra crown, people will fear and respect your power. Grab a golden pair of Egyptian-styled sandals and an awesome staff to carry around, and you’ll be ready to show the modern world how the gods of the ancient one party! Have a friend dress up as a pharaoh and the two of you can show everyone how to ‘walk like an Egyptian’ this Halloween. Look through our makeup kits and find the perfect one to give you the glowing face of a god! Just make sure people don’t start trying to sacrificing goats and virgins in your name… we don’t need humanity slipping back into such dark rituals. Dance moves and finger sandwiches are just as divine.